Zombies--the walking dead, reanimated corpses--are found deep at the bottom of Mori's uncanny valley: though still human in form, they are no longer connected to us by life, and they breach our deepest taboos--cannibalism, grave desecration, the strict separation of life and death. Zombies are have become familiar to most Americans through horror films of the last century. Nearly all find zombies repulsive, but horror fans also find them exciting and even humorous. 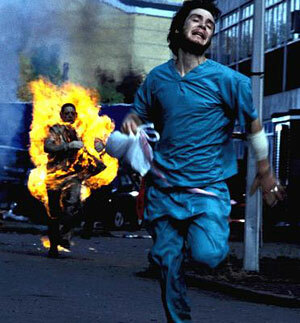 The gore that accompanies any respectable zombie film still connects us to our fear of death in its most palpable form, rotting flesh; but with the fear comes the thrills, for those who can stomach it. The images on this page would be unsatisfying to most horror fans, as the hallmark of modern zombie films is now life-like, over-the-top gore. It will serve us better, though, to first explore the origins of this time-honored creature that began as an obscure Haitian folk myth but is now one of our most revisited horror archetypes. It may first seem that history has little connection to our fictional flesh-eating friends, but they have complex origins, too little discussed and too often ignored by historians and horror fans alike: here we hope to provide the first step in the exploration of the phenomenon. Zonbi by Haitian artist Wilson Bigaud, 1939. African scholars who deign to seriously discuss such topic as the zombie, say the word comes from the Kongo word for "soul", nzambi. When slaves were brought to Haiti and the Vodou religion grew amidst old African traditions and the harsh conditions of slavery, the idea of the zonbi was born. 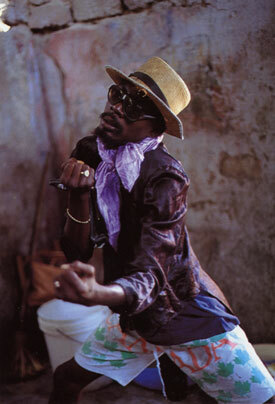 Zombies are found on the fringes of the Vodou religion, not in the everyday praising of the gods. 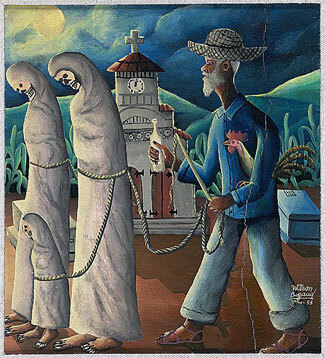 It is estimated that 80-90% of Haitians "serve the spirits" or practice Vodou. In Vodou, all people die in two ways--naturally (sickness, gods' will) and unnaturally (murder, before their time); those who die unnaturally linger at their grave, unable to rejoin ancestors until the gods approve. Souls are vulnerable at this time: their will may be snatched up by a powerful sorcerer (boko) and locked in a bottle which the boko uses to control their un-dead but un-living body. Other times he lets their body rest but uses just the soul. This is does not have to be unpleasant for the soul or body: under the right circumstances, a hardworking man might prefer to continue working rather than lie waiting in the ground, especially if he is used by the boko to help with healing magic. More unsavory boko, though, could purposely kill a man to make a zombie, then force him into mindless toil or worse, black magic & evil intentions. Papa Mondy, a vodou houngan (priest) who works to undo bad magic of "unscrupulous" boko. Here he is being mounted (possessed) by a gede (a usually beneficent graveyard spirit). Zombies and boko are found only on the fringes of the Vodou religion, belonging to the realm of secret societies, not the everyday praising of the gods (lwa). Do Haitians believe that the dead rise and become, at best helpers and at worst slaves? To some zombies are just folktales, to others they are as possible as a car crash, and to still others they are somewhere in between. Most see zombies as a metaphor for hard life without reward, a loss of control, or worse--a loss of faith. Haitians do not fear zombies, they fear becoming a zombie against their will. The few who do see zombies as concrete reality do not fear the zombies themselves (who are only mindless and pathetic); rather, they fear becoming a zombie under the wrong circumstances and against their will. The boko's power to make zombies is used more often as a threat to maintain social order; only rarely will he actually go through with the act of catching a soul. The stories are told with laughter as much as with seriousness, and the zombie remains a potent image in the rural folktales and philosophical discussions of Haiti today. Despite these sensationalistic claims, the very well respected African art historian Robert Farris Thompson has defended Davis. In an introduction to Davis' book Passage of Darkness, Thompson writes: "I would never have been steered in the right direction, taught to take the zombie phenomenon seriously as a social sanction of the greatest import, had I not come into contact with the research distilled in this volume by Wade Davis (xii)." View White Zombie (Dir. Victor Halperin, 1932) online! 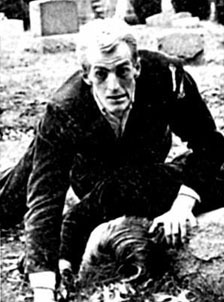 View Night of the Living Dead (Dir. George A. Romero, 1968) online! Hurbon, Laennec. "American Fantasy and Haitian Vodou". In Sacred Arts of Haitian Vodou, edited by Donald J. Cosentino. Hong Kong: South Sea International Press, Ltd., 1988. McAlister, Elizabeth. Rara! Vodou, Power, and Performance in Haiti and its Diaspora. Berkeley: University of California Press, 2002. McAlister, Elizabeth. "A Sorcerer's Bottle: the Visual Art of Magic in Haiti". In Sacred Arts of Haitian Vodou, edited by Donald J. Cosentino. Hong Kong: South Sea International Press, Ltd., 1988.